I usually make a few Valentine's projects every year. But this year, I just didn't have it in me. At least I thought I didn't until I created the button monogram for the Princess' bedroom. I have a collection of vintage buttons that I took from inherited from my mom. And I thought it would be fun to create a pretty Valentine heart using the same method I used to create monogram. The only problem was that once I pulled out the buttons, I didn't have enough of any one shade to create the size heart I wanted to make. So I thinked, and I thanked and I thunked. (And yes, those are technical terms). And I realized that my collection of buttons was graduated in color. So I decided to follow the Ombre trend that is so popular right now, and create three hearts in graduating tones. It was super easy to make. I just created a heart template (so that each heart would be the same size), measured where I wanted them to go on my canvas, and then traced them on. After that, I followed the same steps that I outlined here. ooh these are SO cute! So sweet! Happy (early) Valentines Day! This is so elegant. I'm not really into the red hearts of valentines, but I could live with this! Very cool. I love those lampshades! Did you make those too? That came out so nice with the vintage buttons and I love the lampshades..
Oooooh, so creative! Love it!! So cute! 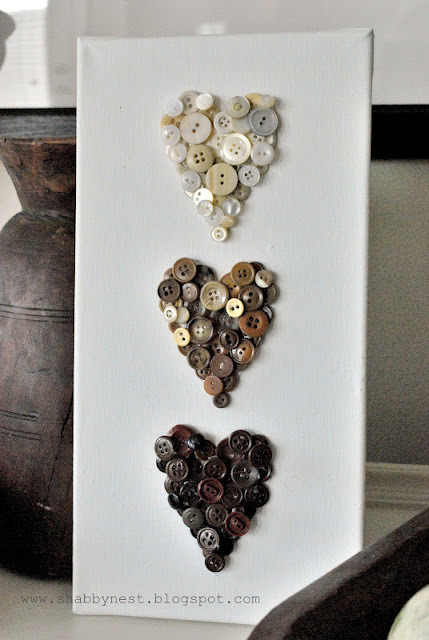 I have a ton of buttons I could use to make this! Thanks for sharing! Love this Wendy! Such a great idea. I'm gonna have to raid my button stash! Wendy--I think this is adorable! Now I want one. I don't have nearly enough buttons. Boo. Ombre is "IN"! 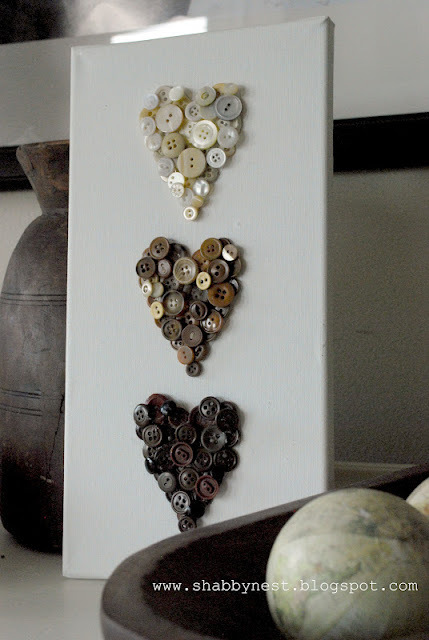 Love the repurposing of buttons for this art piece! So clever! These are gorgeous - perfect for Valentine's but I'd display them all year round! I love that it's a simple idea with a great "wow" effect. 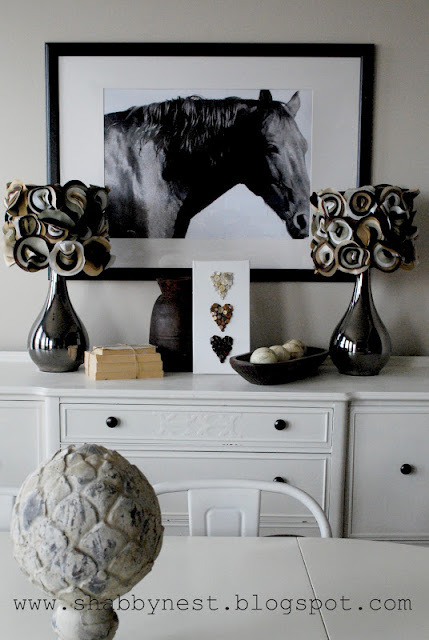 I also love the shades you chose - perfectly coordinated with the ruffled lamp shades!